How could such a disaster happen? Karl Kautsky, once the Second International's foremost theoretician, blamed it on the workers: "who would dare assert that an order given by a handful of parliamentarians is sufficient to make four million class-conscious German proletarians turn right-about face within twenty-four hours, in direct opposition to their former aims? If this were true, it would, of course, be evidence of a terrible collapse, not only of our Party, but also of the masses. [Kautsky’s emphasis] If the masses were such a spineless flock of sheep, we might just as well allow ourselves to be buried”.3 In short, if four million German workers allowed themselves to be marched off to war, it was of their own volition, nothing to do with the parliamentarians who, with the backing of the majority of their parties, voted war credits and (in France and Britain) soon found a place in bourgeois governments of national unity. All over Europe, the workers had had confidence in the International, believed its congresses’ repeated resolutions against the coming war. They trusted the International, that highest expression of the power of the organised working class, to stay the criminal hand of capitalist imperialism. After the ISB meeting, thousands of Belgian workers gathered to hear the leaders of the International speak against the threat of war. Jaurès gave one of his greatest anti-war speeches ever, and the workers cheered him to the rafters. Yet one orator was notably absent from the platform: Rosa Luxemburg, the most clear-sighted and the most indomitable fighter of them all, refused to speak, sick to the heart at the spinelessness and self-delusion she saw all around her: she alone could see the wave of cowardice and betrayal that was to sweep the socialist parties into supporting their national governments’ imperialist ambitions. The contrast with the First International (the International Workingmen’s Association) is striking. Practically the first act of the IWA following its creation in 1864 by a meeting of largely British and French workers held at St Martin’s Fields in London, was to draft an organisational programme and to form a General Council – the centralising body of the International. Once the statutes were drafted, a broad range of workers’ organisations across Europe (political parties, unions, even cooperatives) joined the organisation on the basis of agreement with the IWA’s statutes. Despite the attempts by Bakunin’s “Alliance” to undermine it, the General Council, elected by the IWA’s congresses, enjoyed all the authority of a true centralising body. By its very nature, given the conditions of the epoch, this self-formation of the working class was to take on forms that were specific to and determined by the historical development of each country. In Germany, the workers struggled at first in the difficult conditions of clandestinity imposed by Bismarck’s anti-socialist laws, where the only possible legal action was in parliament, such that the unions grew under the wing of the socialist party. In Britain, still Europe’s most advanced industrial power, the crushing defeat of the great political movement of Chartism in 1848 had all but discredited political action and the workers’ organising energy was largely devoted to building up their trades unions: the socialist parties remained small and insignificant on the political scene. In France, the workers’ movement was fractured between marxists (Jules Guesde’s “Parti ouvrier’ founded in 1882), the Blanquists inspired by the revolutionary tradition of the great Paris Commune (Edouard Vaillant’s “Comité révolutionnaire central”), the reformists (known as “Possibilists”) and the unions grouped in the CGT and strongly influenced by the ideas of revolutionary syndicalism. Inevitably, all these organisations struggled to develop the workers’ organisation and education, and to win union and political rights, against their respective ruling classes and therefore within the national framework. The development of mass union organisations and a mass political movement also helped to redefine the conditions under which revolutionaries worked. The old Blanquist tradition – the idea of a small, conspiratorial band of professional revolutionaries who would seize power with the more or less passive support of the masses – was outdated, replaced by the need to construct mass organisations which perforce must operate within a certain legal framework. The right to organise, the right of assembly, the right to free speech, all these became objects of vital interest to the mass movement: inevitably all these demands, yet again, were posed within the legal framework specific to each nation. To take just one example: whereas the French socialists could get deputies elected to a Republican parliament which wielded effective legislative power, in Germany the government’s direction depended not on the Reichstag (the Imperial parliament), but on the autocratic decisions of the Kaiser in person. It was thus far easier for the Germans to maintain an attitude of rigorous refusal to ally with bourgeois parties, since they were highly unlikely to be called on to do so; how fragile was this position of principle was shown by the way in which it was ignored by the SPD in South Germany, whose deputies regularly voted in favour of budget proposals in the regional Landtags (Länder parliaments). Nonetheless, as the workers’ movements in different countries emerged from the period of reaction and defeat, the proletariat’s inherently international nature reasserted itself. In 1887, the German party congress held at St Gallen in Switzerland decided to take the initiative of organising an international congress; in the same year, the British TUC meeting in Swansea voted in favour of an international conference to press for an eight-hour working day.15 The latter led to the holding of an exploratory meeting in November 1888 in London at the invitation of the TUC’s Parliamentary Committee, attended by delegates from several countries, though not from Germany. These two simultaneous initiatives quickly demonstrated a fundamental split within the labour movement, between the reformists led by the British unions and the French Possibilists, and the revolutionary marxists, whose most important organisation was the German SDAP (the British unions, indeed, were opposed to any participation at all in their initiative by political organisations). In 1889 – the 100th anniversary of the French Revolution, still a reference for all those who aspired to the overthrow of the existing order – there were thus not one but two international workers’ congresses held in Paris simultaneously: the first called by the French Possibilists, the second by the marxist Parti Ouvrier16 led by Jules Guesde. The subsequent decline of the Possibilists meant that the marxist congress (known after its meeting-place in the Salle Petrelle) was thereafter considered as the 2nd International's founding congress. Inevitably, the congress was marked by inexperience and a great deal of confusion: confusion over the highly charged question of validating delegates’ mandates, and also over translations which were undertaken by whichever members of the polyglot assembly happened to be available.17 The most important aspects of the Congress were thus not so much its practical decisions but first, the fact that it met at all, and second the roll-call of delegates. From France came Marx’s sons-in-law Paul Lafargue and Charles Longuet, together with Edouard Vaillant, the hero of the Commune; from Germany came Wilhelm Liebknecht and August Bebel, together with Eduard Bernstein and Klara Zetkin; Britain’s best-known representative was William Morris, and this was in itself indicative of the political backwardness of British socialism, since the membership of his Socialist League was barely numbered in the hundreds. A highlight of the congress was the handshake between the joint presidents Vaillant and Liebknecht, symbolic of the international fraternity between French and German socialists. The 2nd International was founded, but it still had no permanent organisational structure. Existing only for the duration of its congresses, it had no means of enforcing the resolutions that these congresses adopted. This contrast between apparent international unity and national particularities in practice was nowhere more evident than in the campaign for the eight-hour day, centred on the May Day demonstration, which was one of the International’s major preoccupations during the 1890s. Probably the most important resolution of the 1889 Congress was that proposed by the French delegate Raymond Lavigne: that the workers in every country should take up the campaign for the eight-hour day decided by the 1888 St Louis congress of the American Federation of Labour, in the form of massive demonstrations and a generalised stoppage of work to be held every year on 1st May. Yet it soon became clear that the socialists and the unions in different countries had very different ideas as to what the May Day celebrations should mean. In France, partly as a result of the revolutionary syndicalist tradition in the unions, May Day quickly became the occasion for massive demonstrations leading to clashes with the police: in 1891 at Fourmies in the North of France, troops fired on a workers’ demonstration leaving ten dead, including several children. In Germany on the other hand, difficult economic conditions which encouraged the employers to turn a strike into a lock-out combined with the German unions’ and the SDP’s reluctance to have their action dictated to them by anyone outside Germany, even by the International: as a result, there was a strong tendency within Germany to avoid putting the resolution into practice other than by holding meetings at the end of the working day. This German reluctance was shared by the unions in Britain. The fact that the strongest socialist party in Europe should sound the retreat in this way alarmed the French and the Austrians in particular, and at the 1893 Congress of the International in Zürich, the Austrian socialist leader Victor Adler proposed a new resolution insisting that May Day should be the occasion for a real stoppage of work: the resolution was passed against the votes of the majority of the German delegates. Yet only three months later, the SPD’s Cologne Congress was reducing the extent of the International’s resolution, by declaring that it should only apply to those organisations who actually felt it possible to join a stoppage. The history of the May Day stoppages illustrates two important aspects that determined the International’s ability – or inability – to act as a united body. On the one hand, it was impossible to get around the fact that what was possible in one country was not necessarily possible in another: Engels himself was dubious about the May Day resolutions on precisely these grounds, fearing that the German unions might discredit themselves by making commitments that they would in the end be unable to honour. On the other, the very fact of operating in a national framework, combined with the dissolving effects of reformism and opportunism within the movement, tended to make the national parties and unions jealous of their prerogatives: this was especially true of the German organisations since as the largest party they were even more reluctant than others to be dictated to by the smaller parties who ought – so thought many German leaders – to be following the German example. The difficulties experienced in this first attempt at united international action were to bode ill for the future, when the International would play for higher stakes by far. During the last years of the 19th century, with capitalism still in the ascendant – enjoying, indeed, the massive expansion and prosperity that was later to be known, by contrast with the post-1914 era, as the Belle époque – the idea that socialism would be the natural and all but inevitable outcome of capitalism, was undoubtedly a source of strength for the working class. It gave a historical perspective and meaning to the painstaking work of building union and party organisations and it gave the workers a profound confidence in themselves, in their struggle, and in the future – this confidence in the future is one of the most striking differences between the working class at the beginning of the 20th and the 21st centuries. History, however, is not a linear progression and what had been a strength for the workers as they built their organisations was to be transformed into a dangerous weakness. The illusion of the inevitability of the passage to socialism, the idea that this could be achieved by a gradual build-up of the workers’ organisations until, almost painlessly, they could simply step into a place left vacant by a capitalist class whose “private ownership of the means of production has become incompatible with their appropriate application and full development” (Erfurt programme), obscured the fact that a profound transformation was under way in the capitalism of the early 20th century. The significance of these changing conditions, especially for the class struggle, was made explosively evident by the Russian revolution of 1905: suddenly, new methods of organisation and struggle – the soviet and the mass strike – burst onto the scene. Whereas the left on the SPD – above all Rosa Luxemburg in her famous pamphlet on the Mass strike, party and unions – saw the significance of these new conditions and began pushing for a debate within the German Party, the right and the unions did everything they could to suppress any discussion of the mass strike: the trades unions' 1905 congress explicitly banned any discussion of the mass strike, while in the SPD it became more and more difficult to have articles on the subject published in the Party press. In the Communist Manifesto Marx reminds us that the "natural condition" of workers in capitalism is that of competing, atomised individuals: it is only through the struggle that they can achieve the unity which itself is the vital precondition for the struggle to succeed. It is therefore no accident that many a 19th century union banner bore the inscription "unity is strength"; the slogan expressed the workers' awareness that unity was something to fight for, and something to guard preciously once achieved. The same drive towards unity exists within and among the political organisations of the working class, inasmuch as they have no separate interests to defend, either for themselves or within the class itself. Naturally enough, this drive to unity finds its highest expression when the class struggle is historically on the rise, to the point where it becomes possible to create an international party: the IWA in 1864, the 2nd International in 1889, the 3rd International in 1919. The three Internationals themselves expressed a growing political unification within the working class: whereas the IWA had contained a very broad spectrum of political positions - from Proudhonists and Blanquists to Lassalleans to Marxists - the 2nd International was avowedly marxist, while the Third International's 21 Conditions for entry were explicitly intended to restrict membership to communists and revolutionaries and to correct precisely those factors which had caused the failure of the Second, in particular the absence of any centralising authority capable of taking decisions for the whole organisation. Nonetheless, all the Internationals were real arenas of debate and ideological struggle, including the Third: witness, for example, Lenin’s polemic against Left-wing communism and Herman Gorter’s reply. The 2nd International was deeply committed to the unity of the different socialist parties, on the grounds that since there was only one proletariat in any country, with the same class interests, so there should only be one socialist party. There were constant efforts to keep the Russian Mensheviks and Bolsheviks united after 1903, but the main issue during the International’s first years was the unification of the various French parties. This came to a head at the 1904 Amsterdam Congress, where Jules Guesde presented a resolution which was in effect no more than a translation of that adopted by the SPD at Dresden the year before, condemning “revisionist tactics [whose result] would be that instead of being a party which works for the most rapid transformation possible of existing bourgeois society into the socialist social order, ie revolutionary in the best sense of the word, the party would become one which is content with reforming bourgeois society”.24 This was an explicit condemnation of Millerand’s25 entry into government, and an implicit one of the reformism of Jean Jaurès’ Parti socialiste français. Guesde’s motion was passed by a massive majority, and the congress went on to pass unanimously a motion demanding the unification of the French socialists: the following April, the Parti socialiste and the Parti ouvrier united to form the Section française de l’Internationale ouvrière. It is a measure of Jaurès’ greatness that he accepted the majority vote of the International and gave up his own deeply held convictions26 in the name of the International’s unity.27 This moment was probably the closest the International ever came to imposing unity of action in the name of principle on its member parties. Nowhere is this danger more evident than in the resolutions adopted against the looming threat of war. 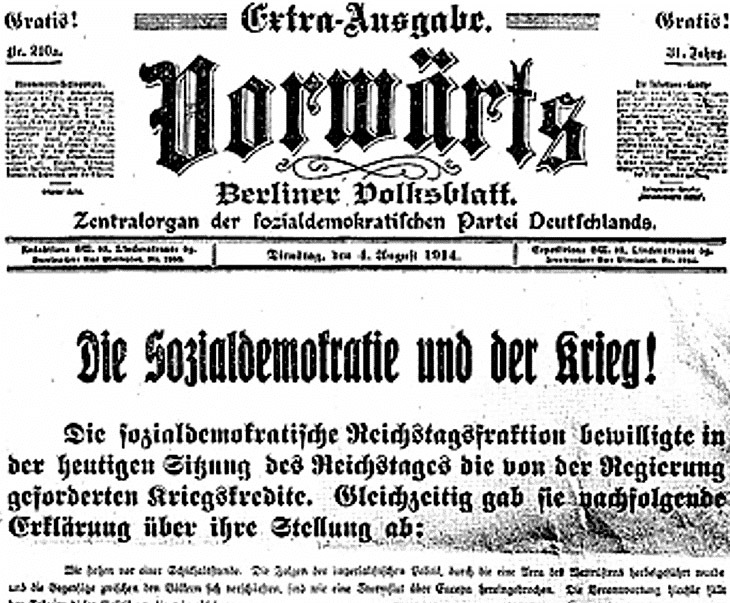 The final paragraphs of the 1907 Stuttgart resolution read as follows: “If a war threatens to break out, it is the duty of the working classes and their parliamentary representatives in the countries involved, supported by the coordinating activity of the International Socialist Bureau, to exert every effort in order to prevent the outbreak of war by the means they consider most effective, which naturally vary according to the sharpening of the class struggle and the sharpening of the general political situation. The problem, is that the resolution has nothing to say about how the socialist parties were to intervene in the situation: they are merely to adopt “the means they consider most effective”. This swept under the carpet three major issues. The first of these was the question of the mass strike, which the left in the SPD had been trying to bring to the fore ever since 1905 against the determined and largely successful opposition of the opportunists in the Party and union leadership. The French socialists, and Jaurès in particular, were fervent supporters of the general strike as a means to prevent war, although by this they meant a strike organised by the unions on the syndicalist model rather than the mass upsurge of proletarian self-action that Luxemburg envisaged, in a movement which the Party should encourage but could in no way launch artificially. It was noteworthy that a joint attempt by the French Edouard Vaillant and the Scot Keir Hardie at the 1910 Copenhagen Congress, to get a resolution passed committing the International to general strike action in the event of war, was voted down by the German delegation. Finally, for all the threats of proletarian action against war, the leaders of the International (with the exception of the left) continued to believe in the diplomacy of the bourgeois classes to preserve peace. Hence while the Basel Manifesto of 1912 could declare: “Let the governments remember that with the present condition of Europe and the mood of the working class, they cannot unleash a war without danger to themselves”, yet at the same time it could “consider the best means [to bridge the hostility between Britain and Germany] to be the conclusion of an accord between Germany and England concerning the limitation of naval armaments and the abolition of the right of naval booty”. The working classes were called to agitate for peace, not to prepare themselves for the revolutionary overthrow of capitalism which alone could guarantee that peace: “The Congress therefore appeals to you, proletarians and Socialists of all countries, to make your voices heard in this decisive hour! (...) See to it that the governments are constantly kept aware of the vigilance and passionate will for peace on the part of the proletariat! To the capitalist world of exploitation and mass murder, oppose in this way the proletarian world of peace and fraternity of peoples!”. The unity of the International, on which any hope of united action against the threat of war depended, was thus founded on an illusion. The International, in reality was divided between a right wing and a left, the former ready and even eager to make common cause with the ruling class in defence of the nation, the latter preparing to answer war with the revolutionary overthrow of capital. During the 19th century, it was still possible for right and left to exist within the same workers’ movement, and participate in the organisation of the workers as a class aware of its own interests; as the “epoch of wars and revolutions” opened, this unity became an impossibility. 1"Eight to ten million soldiers will swallow each other up and in doing so eat all Europe more bare than any swarm of locusts. The devastation of the Thirty Years War compressed into the space of three or four years and extending over the whole continent; famine, sickness, want, brutalising the army and the mass of the population; irrevocable confusion of our artificial structure of trade, industry and credit, ending in general bankruptcy; collapse of the old states and their traditional statecraft, so that crowns will roll by the dozens in the gutter and no one be found to pick them up; it is absolutely impossible to predict where it will all end and who will emerge from the struggle as victor. Only one result is absolutely certain: general exhaustion and the establishment of the conditions for the final victory of the working class" (Engels, Introduction to Sigismund Borkheim's pamphlet Zur Erinnerung für die deutschen Mordspatrioten 1806-1812, 1887, quoted in James Joll, The Second International, p109, Routledge and Keegan Paul, 1974). 2One noteworthy exception was the Serbian Social-Democracy, whose parliamentary deputies refused support for the war even as Austrian shells fell on Belgrade. 3Cited in Lenin, The Collapse of the Second International, chapter 6. 5Cited in Édouard Dolléans, Histoire du mouvement ouvrier (1871-1936) : tome II. 6Member of the Independent Labour Party’s National Council, opposed World War I, but fell ill with cancer in 1915 and was unable to play an active role against the war. 7Cited in James Joll, The Second International, Routledge & Kegan Paul, 1974, p165. 8Joll, op cit., p168. What Jaurès did not know, because he only returned to Paris on 29th July, was that the French President Poincaré had spent his time on a trip to Russia doing everything possible to bolster Russia’s determination to go to war: Jaurès was to change his mind about the French government’s intentions after his own return to Paris, in the days that preceded his assassination. (version française sur http://dormirajamais.org/jaures-1/ : le gouvernement français veut la paix et travaille au maintien de la paix. Le gouvernement français est le meilleur allié de la paix de cet admirable gouvernement anglais qui a pris l’initiative de la médiation. 9The British ruling class wins the prize for hypocrisy, since its own war plans included an invasion of Belgium to attack Germany. 11Cited in Raymond H Dominick, Wilhelm Liebknecht, University of North Carolina Press, 1982, p344. 12Chapter 1, “Bourgeois and proletarians”. 13Indeed, this period of economic expansion was to continue right up to the eve of war. 14From the Inaugural Address of the First International, penned by Marx. 15See Joll, op cit., p28. 17The descriptions of the difficulties over translations are reminiscent of the ICC’s first congresses! 19See Raymond H Dominick Wilhelm Liebknecht, 1982, University of North Carolina Press, p361. 22“La nouvelle tactique” in Socialisme, la voie occidentale (texts by Pannekoek, Luxemburg and Kautsky, Presses universitaires de France), also in Karl Kautsky and the socialist revolution 1880-1938, Massimo Salvadori, Verso editions, p160. 25Alexandre Millerand was an associate of Clémenceau and acted as an arbitrator in the 1892 Carmaux strike. He was elected to Parliament in 1885 as a radical socialist, and was to become the leader of Jaurès’ Parti socialiste de France faction in Parliament. In 1899 he entered the Weldeck-Rousseau government which was supposed to defend the French republic against the threats of anti-Dreyfusard monarchists and militarists – though how real this threat was, was a matter of debate as Luxemburg pointed out. According to both Millerand and Jaurès, he entered the government on his own initiative and without consulting the party. The affair caused a huge scandal in the International, both because as a Minister in a bourgeois government he bore collective responsibility for the repression of workers’ movements by the government, and because one of his fellow ministers was General Gallifet, who had led the massacre of the Paris Commune in 1871. 26Jaurès, whatever his disagreements with the manner of Millerand’s entry into the government, was honestly reformist and profoundly convinced of the necessity for the working class to use parliamentary methods to win reforms from the bourgeoisie. 27This was not the case with others, like Briand and Viviani, who were to leave the party rather than face a future without the hope of a ministerial portfolio. 28“Unser leitendes Zentralorgan”, Leipziger Volkszeitung, 22.9.1899, Rosa Luxemburg in Ges. Werke, Bd. 1/1, p. 558 (quoted in our article on the degeneration of the SPD). 29Social-Democracy of the Kingdom of Poland and Lithuania. 30Quoted in Joll, op cit., p115. 31Quoted in Joll, op cit., p114.